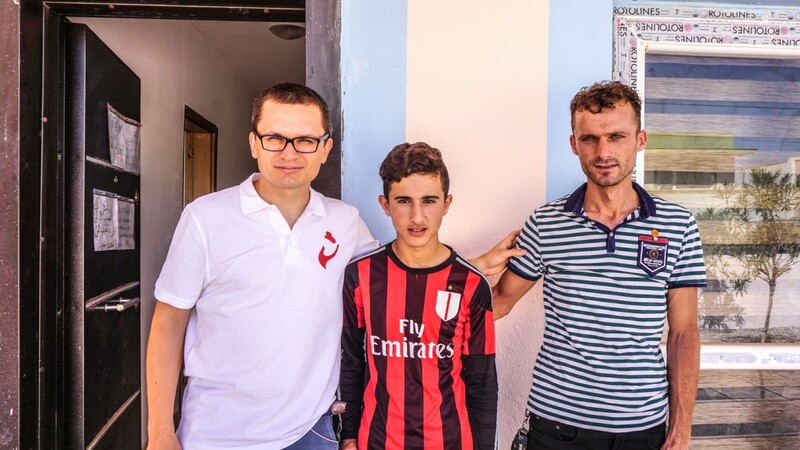 Sabhan is a young Yazidi man aged 15 who spent his childhood growing up in Sinjar, until 2014 when ISIS extremists arrived to destroy his home. He now lives in Ankawa a Christian suburb of Erbil accommodating an unfinished apartment building with 25 families including his own. The families are still waiting on walls and other basic amenities that would make the accommodation livable by Western standards, most of them are also unemployed and unable to move anywhere else. Sabhan sustained a head injury one year ago which left him with severe motor disabilities and he now requires ongoing rehabilitation. Since STEP-IN opened a physiotherapy clinic in August of 2018 he has agreed to come to physiotherapy every day. Sabhan has made tremendous improvements since initiating his physiotherapy program, alas he cannot cover the transport to and from our physiotherapyclinic which costs around $50 per week. Additionally, Sabhan needs head surgery because after his injury his skull needs to be reinforced with a platinum plate to make sure his brain will remain sufficiently protected. This surgery will cost around 500 USD which is unaffordable for Sabhan. Although, we hope that with your help we will manage to support him! Any donation will help Sabhan on his road to recovery, Thank you!